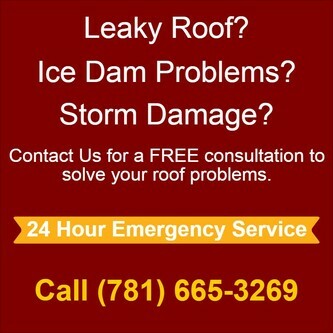 Need Roof Repair in the Melrose, MA area? Nothing can be more unsettling than a leaking roof during a severe Melrose storm or an undetected leak that quietly grows to give you unexpected premature roof failure. When this happens you can depend on Crowell Construction, a Melrose, MA area emergency roof repair contractor with a reputation of excellence. We serve residential homes and businesses in Melrose, Wakefield, Stoneham and Malden. We are just a phone call away - available 24 hour emergency service. Call us at 781-665-3269 and let Crowell Construction protect your home from leaks and damage. 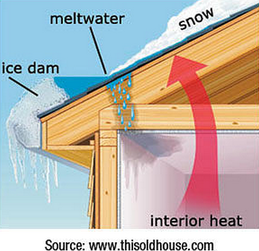 When snow accumulates on a roof, a cycle of melting and refreezing occurs. This refreezing gradually forms what is fondly known as an "ice dam", a growing heap of ice that blocks path of the melted snow. Don't let Ice Dams cause you problems this winter. Call us at 781-665-3269 and let Crowell Construction protect your home from leaks and damage. The winter of 2015 will one to remember for record breaking snow fall as well as roof collapses and ice dams. Preventative measures for roof collapses and ice dams during the winter is to remove snow from roofs.